Its model number and name are #013-015 / Trickster. Character Bio - Axel Walker is a high school dropout who learned to trick or be tricked by his divorced parents. 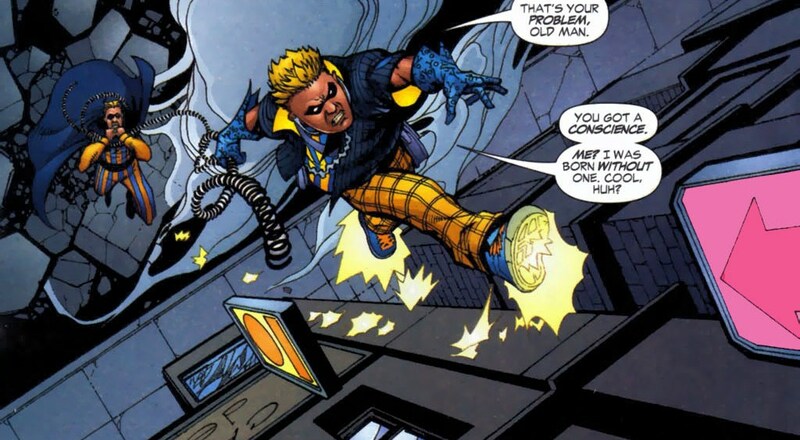 After putting school aside, Axel joined the Rogues by swiping equipment belonging to the original Trickster, James Jesse, in order to become the second incarnation of the villain. 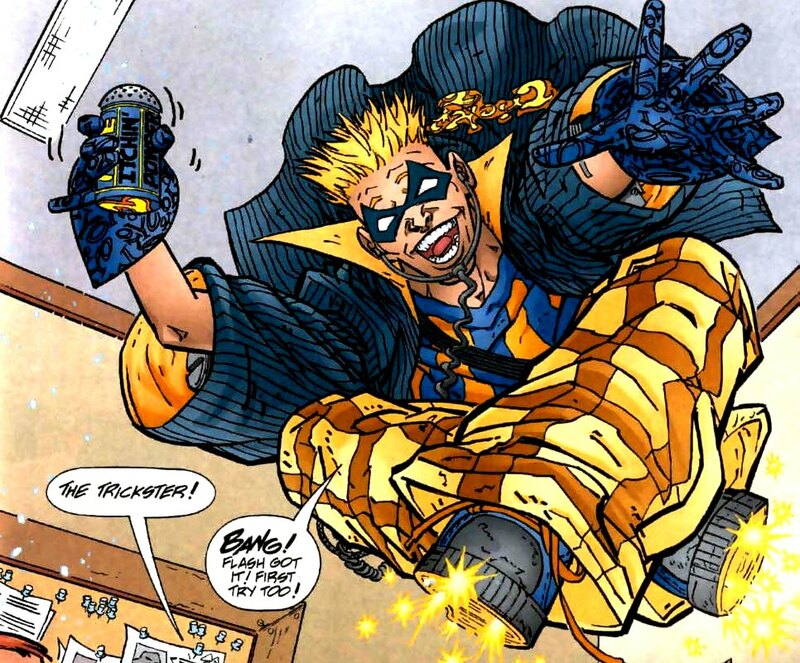 Trickster is an active member of the crime team and frequently conflicts with the Flash and his allies. Trickster views heroes as those who try to fool people into adoring them. Q: Do I have to roll for Malfunctioning Equipment before using the Flying special power? A: Flying is indeed a special power, so yes. As a Human, Trickster has these Human Synergies. As a Rogue, Trickster has these Rogue Synergies. 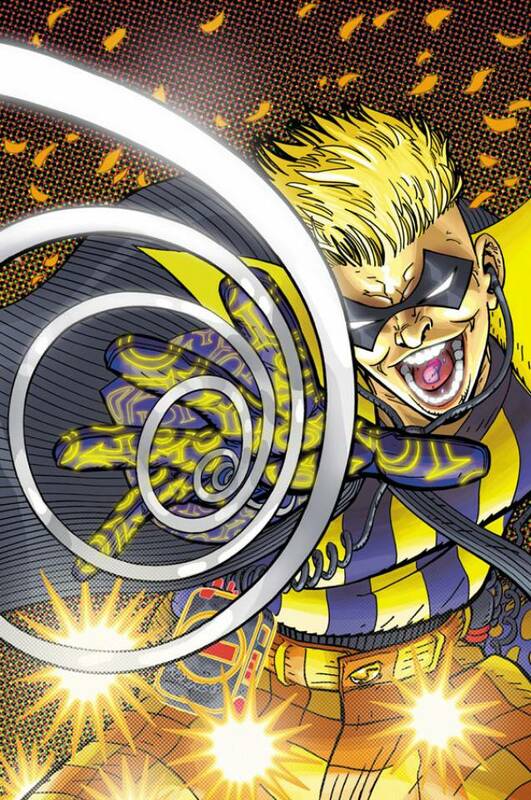 As a figure with the Flying special power, Trickster cannot be affected by aspects of certain special powers. 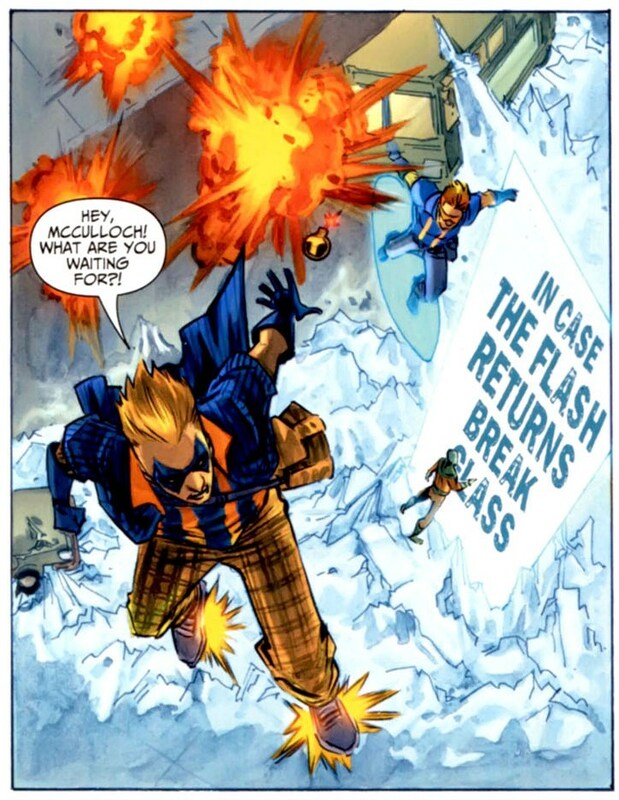 Current Special Powers that Interact Differently with the Flying special power. As a Human, Trickster interacts differently with certain special powers. Current Special Powers that Interact Differently with Humans. As a figure with a Special Attack, Trickster can be affected by aspects of certain special powers. Current Special Powers that Interact Differently with Special Attacks. 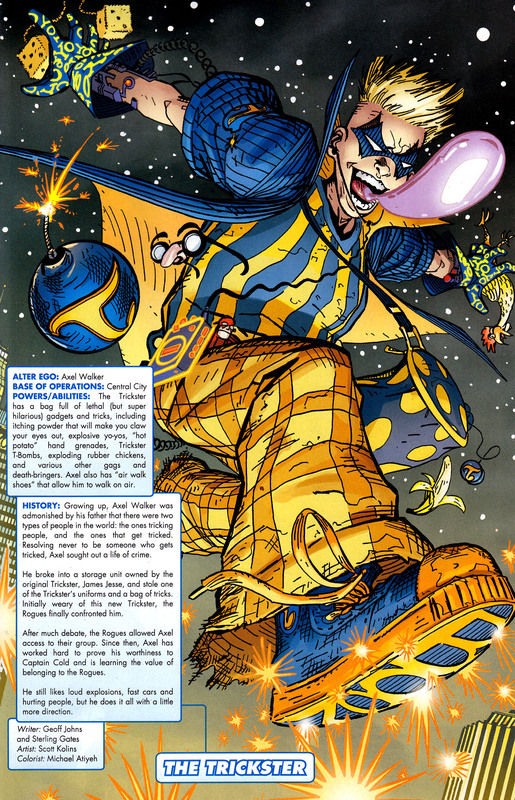 As a figure with the Flying special power, Trickster can be affected by aspects of certain special powers. Current Special Powers that Interact Differently with the Flying special power. Last edited by Ronin; November 13th, 2017 at 10:54 PM. Before Trickster uses any other special power on this card or on an Equipment Glyph, you must roll a combat die. If you roll a blank, Trickster cannot use that special power until the next time an Order Marker is revealed. Whenever a figure moves into engagement with Trickster, you may roll one unblockable attack die against that figure. Range 3. Lob 5. Attack 3. Choose a space to bomb. Any figure on the chosen space and all figures within 1 space of the chosen space are affected. No clear line of sight is needed. Roll 3 attack dice once for all affected figures. Each figure rolls defense dice separately. Last edited by SirGalahad; April 28th, 2014 at 02:34 AM. Looks good! Sharpened Jacks needs to be toned down, though. He'll decimate 5/6 melee squad members otherwise. Agreed - An unblockable attack die would at least give them a 50/50 chance. If you're going to bomb a space like Harley, use similar language. Range 5. Lob 8. Attack 6. Choose a space to bomb. Any figure on the chosen space and all figures within 2 spaces of the chosen space are affected. No clear line of sight is needed. Roll 6 attack dice once for all affected figures. Each figure rolls defense dice separately. After all affected figures have rolled defense dice, roll the 20-sided die. If you roll 13 or higher, remove one unrevealed Order Marker at random from each affected figure's Army Card. Smilex Bomb Special Attack may only be used once per game. Range 3. Lob ?. Attack 4. Choose a space to attackbomb. All figures on an adjacent to the chosen space are affected by Toy Bomb Special Attack.Any figure on the chosen space and all figures within 1 space of the chosen space are affected. No clear line of sight is needed. Roll 4 attack dice once for all affected figures. Each figure rolls defense dice separately. Malfunctioning Equipment is really cool. Even with the possibility of malfunctioning, I agree that the jacks are too powerful. I'm not sure if the unblockable die is the best approach or not. As clean and straightforward as these powers are, I'm worried about whether we've used these exact mechanics before or not (or with the special attack the same range/attack with that explosive effect). Please, someone reassure me! Sharpened Jacks is similar to Engagement Strike (actually, I think I'd like it more similar) and the Toy Bomb is similar to Smilex Bomb. I can handle similar, so long as they're still distinctive. Would it be a bad thing to roll for Malfunctioning Equipment then roll again for Sharpened Jacks? If not you could just put the unblockable die language in their, so he would have to roll anything but a blank to throw the jacks but then have to roll a skull for them to do damage. Yeah, I kind of figured that was the change we were going for here. Also, now that I look again, I don't think we need to call it a "white" combat die. We specify in the C3G rules what type of combat dice we use, so just "combat die" or "attack die" is fine. Alright, I've balanced things in the SP and updated wordings. Sending to ERB now.